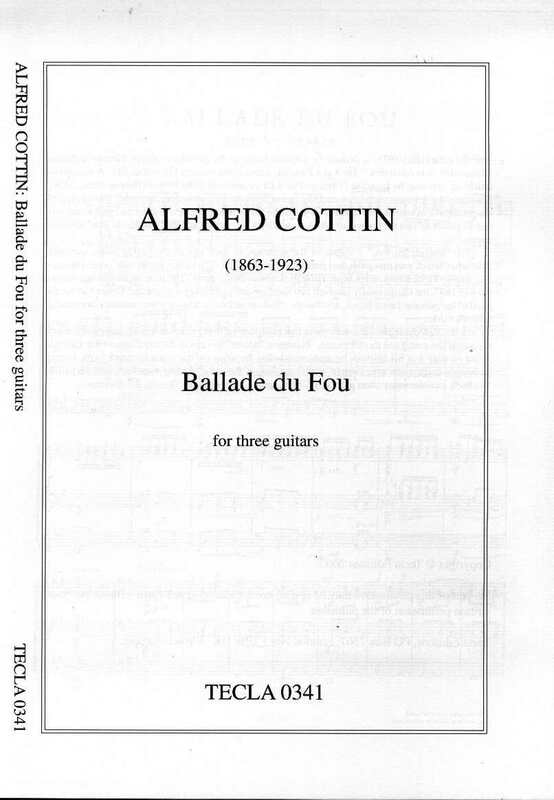 Ballade du Fou for three guitars by Alfred Cottin a really interesting piece published by Tecla Editions. If you play in a group of three guitars, get this piece you will really enjoy it! An interesting, lively, and most unusual piece for three guitars. To buy three copies for a reduced price, enter three copies and it will automatically show the discount. Alfred Cottin’s “Ballade du Fou” (“Ballad of the madman, or fool”) is an interesting, lively, and most unusual piece for three guitars, carefully structured, which was probably composed and first published in about 1900 or shortly after. Pujol calls it preeminent among Cottin’s works. No guitar ensemble should be without it. Reprint of the original edition, with a preface by Brian Jeffery. Score only (3 pages); parts are not provided. But you can purchase three copies, one to be used by each guitar (see above). (Note: this is simple A4 sheet music, without cover). Alfred Cottin (1863-1923) is perhaps best known today as the guitarist to whom Tárrega dedicated “Recuerdos de la Alhambra”. He was a Parisian, active in the musical life of that city. Mr. Andreas Stevens tells me that the Ballade du Fou was published by the Freie Vereinigung in October 1905, and that would probably have been taken from an earlier French publication. Cottin is mentioned in an article: Jaime Bosch and the guitar in Paris at the end of the nineteenth century. To order direct, click the appropriate button below and worldwide carriage by Royal Mail Priority Air Mail will be added at the checkout. You can pay by debit card, credit card, or PayPal. Copyright 2009 by Tecla Editions. Errors and omissions excepted.